I've never been a big sports fan, in part, because the ticket prices to attend virtually any professional sporting event is beyond ridiculous. I remember attending my first professional baseball game with my Dad at Fenway Park when I was a kid. That event remains one of the most memorable events I spent with my father when I was growing up. But the prices to attend games like that are now simply out-of-reach for many families, and a lot has to do with the salaries for players, although the leagues can afford that with the costly TV broadcasting rights deals they sign for the games. Its little wonder that minor league sports leagues of all varieties (including the Brooklyn Cyclones baseball team, which has consistently enjoyed sold-out audiences more so than any of the major league games do in New York, including the New York Yankees or the New York Mets) are on a roll. There's also the not-so-little issue of the NFL still clinging to nonprofit status (exempting the NFL from paying Federal taxes) even though its CEO is better-paid than the CEOs for than many, many for-profit entities (the CEO for the NFL makes $30 million per year, more than both the CEOs for Coca Cola and Walmart earn). What charitable function does the NFL serve? Also, Major League Baseball (MLB) dropped its own nonprofit status over a decade ago when a similar complaint came up and has been paying taxes (and wasn't ruined as a result), so why won't the NFL do the right thing? It's beyond reprehensible, but at this point, unless U.S. lawmakers revoke its nonprofit status, that will continue, and I don't expect that to happen anytime soon. U.S. Congress finished 2013 as the least productive Congress in American history (see http://ow.ly/t4w6T for more background). By the way, there's currently a petition on Change.org to revoke NFL's nonprofit status at http://www.change.org/NFLnonprofit if you'd like to see that change. 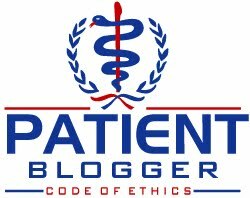 They've aligned themselves with another organization with a very similar goal at http://www.sacknfltaxbreaks.org/. You won't be hurting the NFL, but you might get rid of taxpayer giveaways to an organization that clearly doesn't need them. My personal indifference to major league sports aside, this Sunday is the Super Bowl, which is arguably one of the biggest live events in the U.S. each year. It also happens to be taking place in New York, rather than some sunbelt location raising the possibility they might consider other locations in the future. The teams this year come from smaller NFL markets, notably Seattle and Denver (both Washington and Colorado legalized recreational marijuana in the 2012 elections, prompting some nickname this one the "Stoner Bowl" ... indeed, a pro pot-legalization organization has rented several huge billboards outside of the Meadowlands in New Jersey to make that very point, see http://ow.ly/t4xzS for details). Most of us won't be getting stoned, but a lot of us will be watching the game with family and friends. Which brings me to today's topic: the food. Traditionally, Super Bowl Sunday is a day with lots of food, little of which is very healthy food. If the data is correct, Americans will spend nearly than $1 billion dollars (or more) on Super Bowl snacks alone. Yet even seemingly healthy appetizers are caloric, with cheese being a very common ingredient (and the calories add up fast), salt, etc. Rather than turn this post into a lecture about what should or should not be served (after all, I'm guilty of indulging, too! ), I thought it might be useful to offer a few alternatives, so when you're munching the deep-fried tortilla chips with some kind of dip (salsa may be OK, but the queso dip, probably not so good), you don't have to regret all of it later. 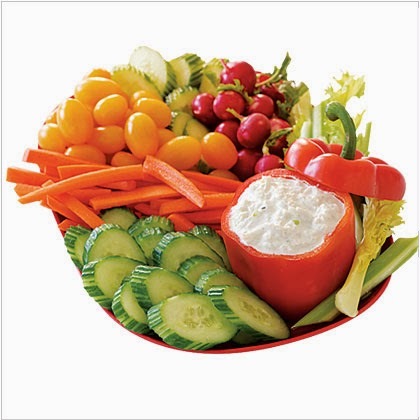 To be sure, I am always a big fan of Crudité (better known as raw veggies, and they're so easy to prepare, in many cases the supermarket sells them already prepared, but you really should toss the Ranch dressing that comes with the veggies into the trash, more on that in a second). You can do some cool things with presentation. This photo shows how a hollowed-out red pepper was used as the bowl for the accompanying dip, so there's no clean up necessary, and it looks good, too. Roasted or grilled veggies are also great. I prefer to prepare my own crudité, but I don't want anyone to spend more time than they have to in the kitchen. Ranch dressing is an easy and popular accompaniment to go with veggies, but I suggest skipping the Hidden Valley Ranch variety and consider grabbing a bottle of Bolthouse Farms Ranch dressing instead. Its typically sold in the refrigerated produce aisle of most supermarkets, rather than on the shelf with the shelf-stable bottled salad dressings. 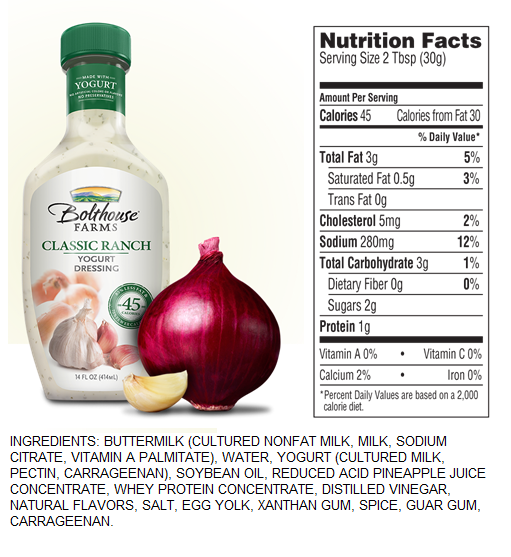 They've (Bolthouse Farms, a wholly-owned subsidiary of Campbell Soup Company since 2012, see http://bloom.bg/1exd18r for the news) taken an American classic (ranch dressing), but instead of using lots of fattening and highly-caloric mayonnaise and cream, they've substituted yogurt instead. 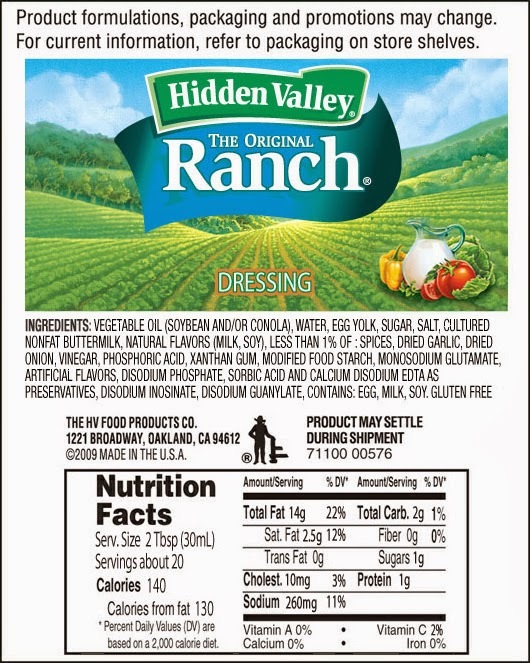 The calorie count for a serving is less than half of what typical varieties of ranch dressing contain (45 calories vs. 140 for a serving of Hidden Valley Ranch dressing), so you won't do quite as much damage, and I think it tastes the same. I would guess your fellow Super Bowl watchers probably won't even notice the switch. However, there are other things you can do, depending on how creative you want to get. Since many people spend the Super Bowl with friends and/or family, they may be asked to bring a hors d'oeuvre to the party. Aside from crudité and lower-calorie ranch dressing, consider a re-imagined version of a classic appetizer recipe instead, as well the following easy ideas as well. One recipe that I've tried and rather like I found in the newspaper a few years ago (in 2012). 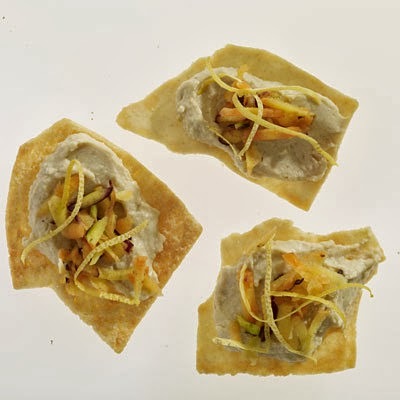 This one is the most complicated (not that its especially difficult or complex) of the hors d'oeuvres I will share in this post, the others require little effort and can be prepared in minutes. 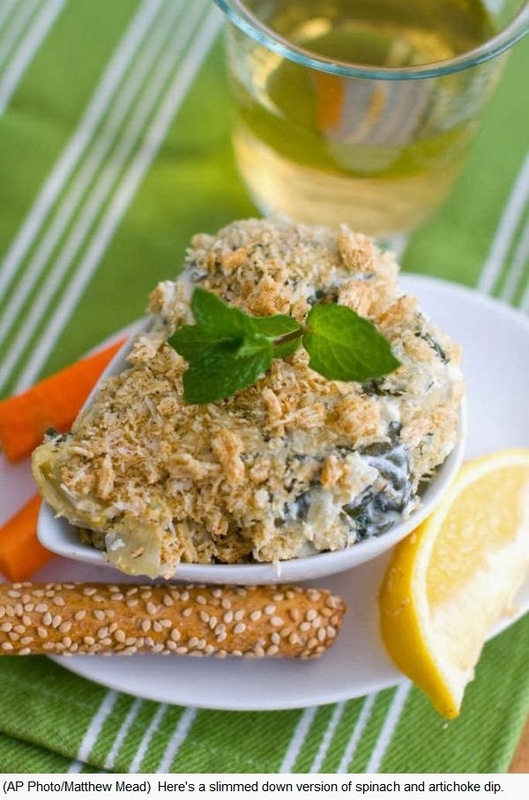 "Spinach and artichoke dip sounds like it should be a virtuous treat. After all, it's loaded with vegetables. Trouble is, it's usually more mayonnaise and cheese than spinach and artichoke. So we decided to see if we could come up with a version that isn't so out-of-sync with healthy eating." This recipe takes a bit of prep-work but the crudité will save you time, and I'll offer another easy recipe to accompany this, so you can bring a few tasty and interesting items to your Super Bowl gathering. Below is the article text (its short) for this recipe remake. A downloadable version which I found online follows. Spinach and artichoke dip sounds like it should be a virtuous treat. After all, it's loaded with vegetables. Trouble is, it's usually more mayonnaise and cheese than spinach and artichoke. So we decided to see if we could come up with a version that isn't so out-of-sync with healthy eating. First order of business was to nix the mayonnaise. But, of course, we wanted something that had a great creamy texture and that could be heated. Greek style yogurt blended with low-fat cream cheese (Neufchatel) worked beautifully. It even added a subtle tang, which we enhanced with some lemon zest for a nice spring flavor profile. Some fresh herbs took it ever further. Next up, dealing with the cheese. We handled the inner gooey-ness with the aforementioned cream cheese. But often there also is a pile of cheese or bread crumbs (or both) on the top. After it's broiled, we wanted that textural contrast and the toastiness that comes with it. We found that crushed and seasoned whole-grain crackers worked well. Just note that different varieties of crackers can have widely varying nutrition. So be sure to read the labels carefully to select a whole-grain cracker with modest amounts of fat and calories. Aim for around 100 to 120 calories and 4 grams of fat per serving. You'll also want about 3 to 4 grams each of protein and fiber. Lastly — and most importantly — was upping the amount of spinach and artichoke. We went with canned artichokes for ease. They also are available frozen. Either way, be sure to get the variety in water, not oil. Fresh baby spinach got a quick saute with onion and garlic before being added. Serve the warm dip with whole-wheat pita chips, baked tortilla chips or veggie sticks. Heat the oven to 400 degrees. Coat a small casserole or gratin dish with cooking spray. In a small bowl, combine the cracker crumbs, garlic powder, onion powder and Parmesan. Set aside. In a food processor, combine the yogurt, cream cheese, lemon zest, oregano, mint, salt and pepper. Pulse until smooth. In a large skillet over medium-high, heat the oil. Add the onion and garlic and saute until soft, about 5 minutes. Add the spinach and cook until soft and any liquid has evaporated, about another 5 minutes. Remove from the heat and stir in the artichokes and the yogurt mixture. Spoon into the prepared dish. Sprinkle the cracker crumb mixture over the dip and bake for 10 to 15 minutes, or until hot. Serve warm. Approximate nutrients per serving: 120 calories, 5 g fat, 2 g saturated; 10 mg cholesterol; 560 mg sodium; 3 g fiber. Copyright 2012 Associated Press. All rights reserved. You can download an Adobe Acrobat (PDF) version of this recipe HERE. The next two appetizer ideas were courtesy of Health magazine (see http://tinyurl.com/o3nba7u for these and others), but they were so quick and easy that they were definitely worth trying at your next party, whether its for the Super Bowl or some other occasion. Of course, nice photos are always a selling point! Spread 8 ounces hummus evenly onto baked pita chips (12-ounce bag). Shred 1 large carrot; distribute evenly over chips. Zest rind of 2 lemons; place a few pieces atop carrot. I've added some of my own feedback on this recipe one because this is a recipe that lends itself to some creativity IMHO. Alternatives to the lemon zest (for variety and flavor) include various dried herbs and spices. To make things easy, I've found it easy to use Mrs. Dash seasoning blend varieties that you like (see http://www.mrsdash.com/products/seasoning-blends). I'm personally quite fond of the Onion & Herb Seasoning Blend (although my local supermarket no longer carries it) as well as the Lemon Pepper Seasoning Blend, but as I said, the selection is yours. More creative alternatives include using ingredients like powdered wasabi, which I personally really like (it can usually be found in Asian supermarkets). A blend with salt is great (I use 2 tbs. or wasabi and 2 tsp. of salt, though I would skip the salt for this particular recipe because its really not needed here. The trick is to use these ingredients to enhance the flavor, just don't use too much. Remember, there's already flavorful hummus in this recipe (and even there, you can use varieties other than plain tahini-flavored hummus, although there's nothing wrong with that). Mix things up and make a couple different versions, just be sure your Super Bowl guests or friends know what each is. 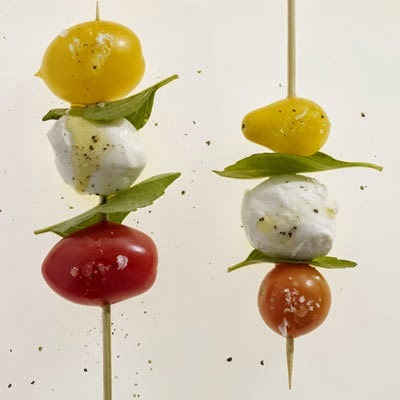 Using 2 pints cherry or grape tomatoes, 1 pound bocconcini (fresh mozzarella), and 1 bunch fresh basil, thread ingredients onto skewers. My personal preference is the yellow and orange tomatoes because the red ones are rather flavorless. Sprinkle each skewer with sea salt and black pepper; drizzle with extra-virgin olive oil. So these are my contribution to Super Bowl Super Bowl XLVIII hors d'oeuvres menu. Any other suggestions? Feel free to add them to the comments.